Placental mammals and marsupials diversify. The first insectivores, primates and rodents evolve. 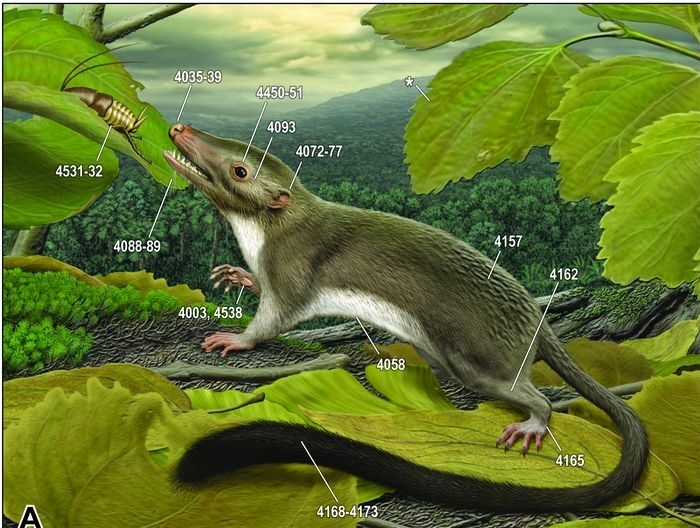 During the Paleocene epoch 65-56 million years ago mammals diversify rapidly. Several groups of the placental mammals evolve, including insectivores, bats, primates and rodents. Also marsupials diversify. Marine life survived the mass extinction better than terrestrial life and life in the seas is rich and very diverse. The supercontinent cycle turns towards the formation of the next supercontinent, and the volcanic activity at the mid-ocean ridge diminishes. The ocean levels sink, and more of the costal seas become dry land. The continental drifts cause the uplift of the Rocky Mountains in the North Americas, and the Andies start to rise up in the South Americas. Also the Alps start to form by the collision of the African continent into the European continent, and Himalaya start to form by the collision of Indian plate to the Asian plate. Australia, Antarctic and Southern America are still connected, forming the remains of the large Gondwana continent. The marsupials spread from the Northern America, via Southern America and Antarctic into Australia prior to the separation of these continents.